Yes, it really is possible to grow birch trees in containers, even on a Brooklyn rooftop! My clients are always amazed to hear how well these trees will do on their rooftops and terraces. Nothing compares to the white bark of Himalayan birch trees, which look beautiful at any time of year. Multi-stem trees tend to do better in containers than single-stem trees because they are less top-heavy and less likely to blow over in a strong wind. Underplantings include alberta spruces, dwarf lilacs, pink petunias, African daisies, and purple salvia. This Brooklyn rooftop terrace also features red azaleas in glossy brown Asian ceramic pots. All of the planters contains automated drip irrigation and up-lighting that points up at the trees at night. Rooftops have become very trendy as of late, but they’ve been around since some of our earliest civilizations. The first known roof gardens were the ziggurats of ancient Mesopotamia. Massive stone structures built between 4,000 – 600 BC, they took the shape of stepped pyramids with no interior rooms. They provided cool and shady places with trees and flowers on each terrace, used to escape the heat and socialize. 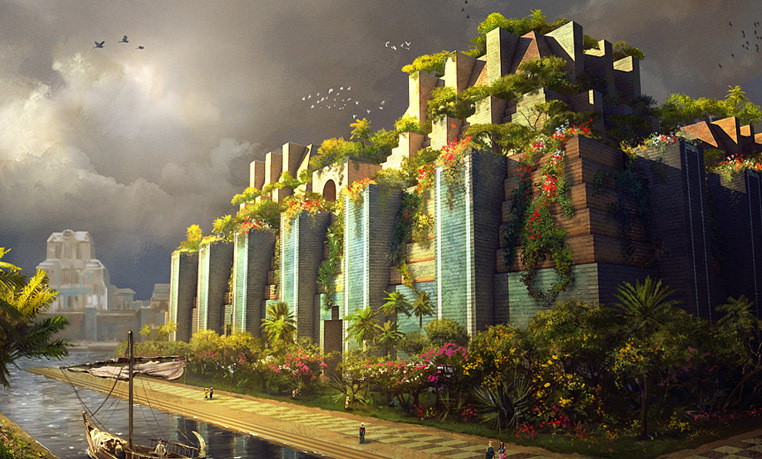 The most famous ones were the famed Hanging Gardens of Babylon, the existence of which are only supported by classical writings based on oral histories; no archeological proof has ever been found. But, the famed gardens are one of the Seven Wonders of the Ancient World. The next recorded roof gardens were in Pompeii. The eruption of Mt. Vesuvius captured these roof gardens, which were an extension of the living room; a place to socialize and dine away from the heat. The best-preserved one was found in the Villa of Mysteries, which had a U-shaped terraced arcade where plants were grown directly in the soil on the roof. Fast-forward to The Renaissance, with the Italian’s symmetrical and orderly designed roof gardens setting themselves apart from their predecessors. The oldest and best-preserved roof garden is located in the town of Pienza in Sienna, Italy. In 1463, Pope Pious II commissioned Bernardo Rossellino to design a palazzo for his personal summer residence complete with a roof garden filled with sculpted trees and manicured parterres.